A view of the new Clark International Airport terminal building from the Tropical Plaza below, inspired by the Zambales mountain range surrounding the city of Clark. The uneven pitches of the roof mimics the organic silhouette of the southwestern part of northern Luzon. As Clark is being groomed as an aerotropolis, it’s only fitting that the city’s airport gets a new addition. 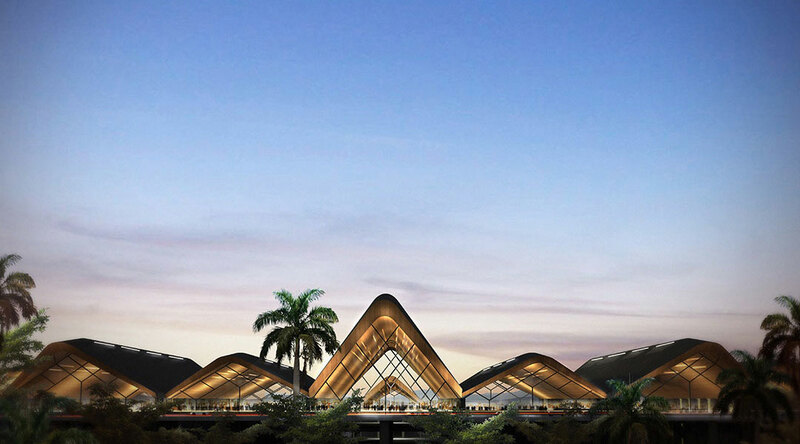 Under the Build, Build, Build program, the P9.36-billion development of the new Clark International Airport (CIA) terminal, by architecture and design duo Architect Royal Pineda and Designer Budji Layug of BUDJI+ROYAL, now has an image Filipinos can expect to become reality in June 2020. Aerial view of the new terminal building that is almost the same size as the Hong Kong International Airport Terminal. Expected to help decongest the Ninoy Aquino International Airport (NAIA) in Manila and envisioned to be a major Philippine gateway upon full development, the new Clark International Airport terminal covers 101,977 square meters for its Phase 1 with an estimated capacity of eight million passengers per annum. The new CIA building is framed by the trees lining the Tropical Plaza, where people can welcome and send-off their friends and families in the gardens and restaurants. The plaza celebrates the closeness and warmth of Filipino ties. Even before arriving at the plaza, the airport’s undulating roof can be seen sitting proudly atop a predominantly metal, lahar concrete, and glass building façade. Profile of cut bamboo has slits of skylights to let in more natural light to the interior. BUDJI+ROYAL, known for its design advocacy of “Modern Filipino Architecture+Design,” takes cues from the way we live today, our tropical climate, and creates a strong sense of place. Central Luzon region’s landscape of plains surrounded by mountain ranges is reinterpreted in the new terminal building’s undulating form, portraying the poetry of the three major land masses surrounding the province of Pampanga: Mt. Arayat, Mt. Pinatubo, and the Zambales Mountain Range. Warmer and tropical tones are used to make the terminal building itself cohesive with the landscape. The long span metal and glue laminated timber make up the structure, the latter steadily gaining more value in design and construction with its innovative engineering and tropical aesthetic, and cost-competitiveness. The terminal ceiling is an interpretation of parol and capiz grids, strengthening local cultural identity. The interiors complement its refreshing and permeable architecture. Opposite the ceiling, the flooring will be of locally sourced material, lahar or the volcanic debris from Mt. Pinatubo, fashioned in a terrazzo or marble finish. The understated flooring creates an elegant complement to the grandeur of the roof. According to BUDJI+ROYAL, the use of lahar is an ode to the Filipinos’ resiliency, rising from the ashes of the June 1991 eruption of the Mt. Pinatubo. The lahar concrete material will also be the “architectural fiber” of the New Clark City and the airport. The floor to ceiling glass panels allow unobstructed view of the aircrafts with the panoramic Pampanga landscape as backdrop. Notice also the dark flooring made of lahar—a contrast to the light color of the glulam ceiling. “Apart from the architecture, we want to celebrate the culture of Filipinos—we greet and send off our loved ones. So the planning takes into account the comfort of well-wishers and greeters,” says Layug in an interview with Inquirer.net. As complementary infrastructure to the New Clark City, the airport is seen to boost Philippine tourism and exhibit Philippine vernacular architecture to both local and foreign audiences. The airport is also endorsed as one of Central Luzon’s main growth hubs alongside the Philippine National Rail (PNR) North 2 Project that will connect Malolos, Bulacan, CIA, and Clark Green City (a masterplanning collaboration between BUDJI+ROYAL and AECOM). Visit www.budjiroyal.com for more information.